Today is World Meteorological Day. This day is celebrated every year on 23 March to commemorate the entry into force in 1950 of the convention that created the World Meteorological Organization. President Ram Nath Kovind will visit Croatia, Bolivia and Chile from 25th of this month to 2nd of April. Mr Kovind will meet his Croatian counterpart and Prime Minister of Croatia and discuss the issues of mutual interest. In Bolivia, the President will hold restricted and delegation level talks with his counterpart. He will participate in India-Bolivia business forum meeting and interact with students. On the last leg of his visit, Mr Kovind will reach Chile and will hold talks with Chile Counterpart and discuss issues of mutual interest. Improving Trade and Economic relations will be on the agenda. President's visit to these three countries will further strengthen India's bilateral relations with them. France has approached the European Union to designate Masood Azhar as a terrorist. The EU will take its decision once their process of designating a terrorist is complete. Indian Air Force will participate in Langkawi International Maritime Aero Expo, LIMA 2019. The expo will take place in Langkawi, Malaysia from 26th to 30th March 2019. Indian Air Force is participating in the Expo for the first time and it will showcase its indigenously developed LCA fighter aircraft. 88 years ago, on March 23 in 1931, Shaheed Bhagat Singh, Shivaram Hari Rajguru and Sukhdev Thapar were hanged by the British for their alleged involvement in the killing of John Saunders. 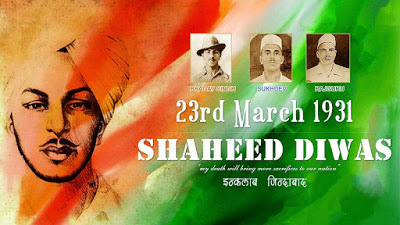 They sacrificed their lives for the independence of India but their inspiring actions continued to stir the desire for freedom until it was achieved in 1947. Former US President Jimmy Carter has become the longest-living President in American history at 94 years 172 days old as of March 22. Carter surpassed ex-President George HW Bush, who died last year. The United Arab Emirates (UAE) today projected Jacinda Ardern (New Zealand Prime Minister)'s image on the Burj Khalifa, the world's tallest structure in Dubai, in thanks for her response to last week’s mosque shootings. Dubai ruler Sheikh Mohammed bin Rashid Al-Maktoum praised Ms. Ardern’s “support to the Muslim community” after a white supremacist gunman attacked two mosques on March 15, killing 50 people. GVK Airport Holdings is acquiring ACSA Global's entire 10% stake in Mumbai International Airport (MIAL) for ₹924 crore, thereby taking its holding in the company to 74%. This comes less than a month after GVK Airport exercised its right of first refusal to acquire South African firm Bidvest Group's 13.5% stake in MIAL for ₹1,247.4 crore. Finance Minister Arun Jaitley today announced that the government exceeded its disinvestment target for the current fiscal by ₹5,000 crore and the proceeds have touched ₹85,000 crore. The government set a disinvestment target of ₹90,000 crore for the next fiscal year. It recently raised ₹14,500 crore when Power Finance Corporation acquired the government's 52.63% stake in Rural Electrification Corporation. The government has appointed Vice Admiral Karambir Singh as the next Chief of Naval Staff. Admiral Sunil Lanba, who is the current Chief of Naval Staff, will vacate the office on May 31. Former Supreme Court judge Pinaki Chandra Ghose today took oath as the 1st Lokpal, anti-corruption ombudsman, of India. The Lokpal's appointment comes 5 years after the Lokpal Act received the President's approval. The International Cricket Council (ICC) has allowed Test-playing nations to have the players sport their names and numbers on their jerseys. The move is a part of the wider plan to promote Test cricket. The change will be introduced on August 1 for the World Test Championship. India defeated Asian Games gold medallist Japan to start their campaign at the Sultan Azlan Shah Cup hockey tournament at Ipoh Malaysia today. India will play Korea in their next league game tomorrow before taking on hosts Malaysia on March 26, Canada on March 27 and Poland on March 29. The top two teams from the round robin league stage will play in the final on March 30.